Need an easy side dish? The Chinese do not eat really eat salad per se. Bowls of leafy greens are usually cooked. Chinese chicken salad is an American invention. 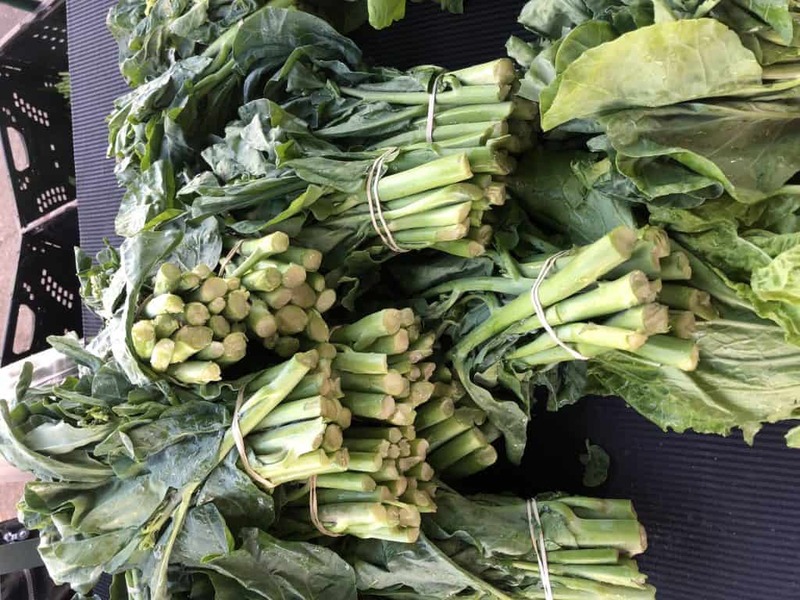 These chilled Chinese broccoli spears might be the closet thing to a cold leafy green side dish in traditional Chinese cuisine. Otherwise known as “gai lan,” Chinese broccoli is similar to broccoli in its pronounced edible stem. It is thick but edible. Like broccoli, it can be served hot or cold. Towards the end of the summer season, when they in season, you may see little yellow flowers on the tips. These yellow flowers are still edible. They just indicate the end of the plants’ life. What if I can’t find Chinese broccoli? 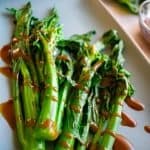 If you don’t have Chinese broccoli, this can be done with regular old broccoli spears or even broccolini. Some say that the flavor is akin to broccoli, with a stronger flavor. Broccoli rabe would not be a good substitute, since it tends to be bitter, and tastes much better when sauteed. 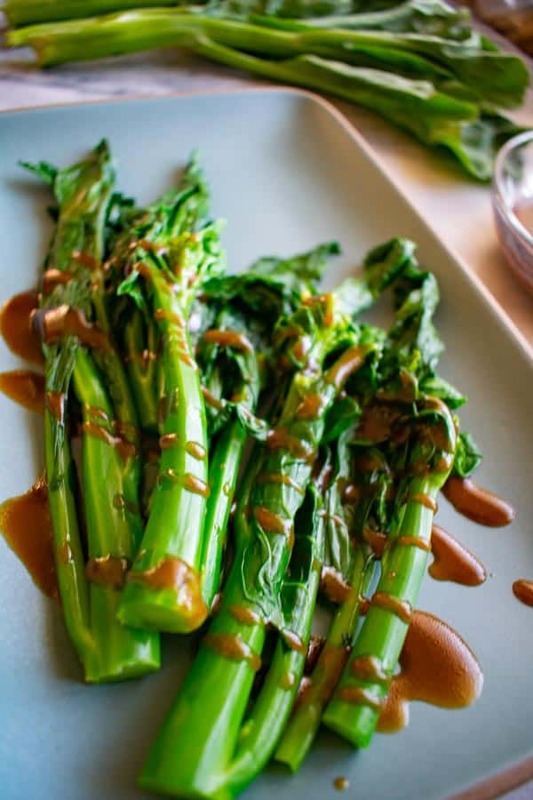 Restaurants usually have plates of these Chinese broccoli spears ready to drizzle on oyster sauce when you order it. You could do that here too, but plain oyster sauce is very salty. This dressing is an alternative. The salt is tempered with olive oil and a touch of sweetness is added with dark soy sauce. 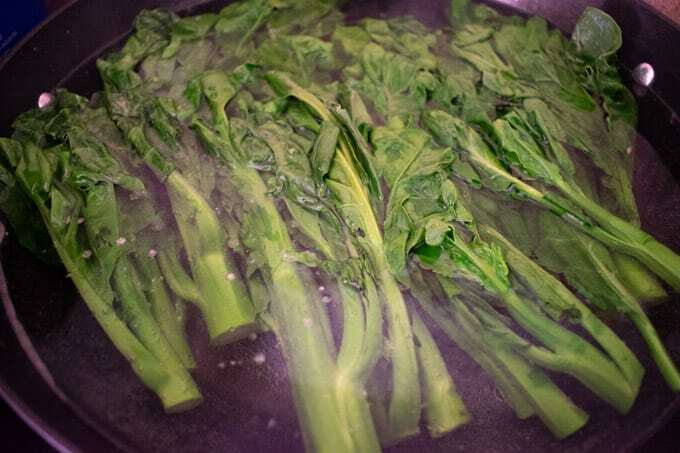 Once the Chinese broccoli is boiled, drain and squeeze out the water, otherwise, it will be too watery. In high end Chinese restaurants, this will be served on a bed of ice, an honor usually reserved for seafood. Other preparations for Chinese broccoli are simply stir-fried with garlic and oyster sauce. However, this make ahead version gives the cook a well deserved break from the wok. Slowly drizzle in olive oil into the oyster sauce while whisking. The mixture will become very thick. Add hot water and dark soy sauce to thin it out to a pourable consistency. Set aside. Cut off about an inch off the stem of the Chinese broccoli. Put into boiling water, and cook for 2-4 minutes until the stem can be easily pierced with a small paring knife. You will want to cook the stems to al dente and not mushy. Drain the Chinese broccoli and shock in ice water or run over cold water until room temperature. Next, you will need to squeeze out excess water with your hands, so the leaves are no longer wet. 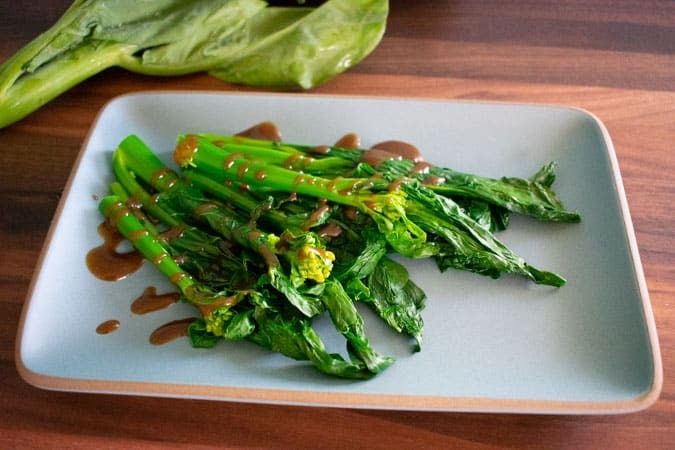 Arrange the Chinese broccoli on a plate, and refrigerate until ready to serve. Drizzle on the reserved dressing right before serving. This dish will last for a few days in the refrigerator. Keep the dressing separate. The olive oil will split out separate out from the oyster sauce, but you can whisk it back together with some hot water. It’s always good to have some chilled Chinese broccoli in the fridge ready to go. It makes a healthy snack or an easy side dish. Bring a large pot of water to a boil. Trim 1-2 inches off of the tough stem from the chinese broccoli spears. Blanch the broccoli for 2-4 minutes, just until the the thickest part of the stem can be easy pierced with a knife. Drain and shock in ice water or the coldest water you have. Squeeze out the leaves to remove as much water as possible. Arrange on a serving plate. For the dressing, gradually whisk in olive oil into the oyster sauce. Add dark soy sauce and hot water to thin out to a pourable dressing. Spoon over the Chinese broccoli. P.S. Do you like broccoli? Please spread the Asian ♥ and share! Previous Post: « Why is Chicken so Cheap?